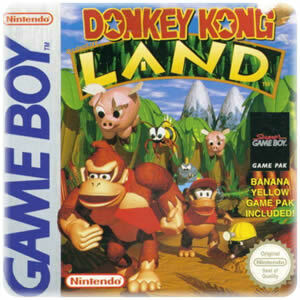 Donkey Kong Land is a 2D platformer for the Game Boy system. It was the first game I ever played and it seems like was a great first game since I still today enjoy playing it. I played through it up to 100% just a few minutes ago, so I thought, what about throwing together a FAQ for it? A few hours of research and writing later, here ya go! The page is pretty long, so a quick list to the different sections is provided in the sidebar. Enjoy! A list of the various foes and friends you'll encounter in the game. Their real names don't appear in the game, but a quick (well not so quick) Google was enough to unravel their identities. This is currently to my knowledge the only really complete guide of creatures online, all the ones I've read so far either mislabeled some enemies, included ones from other Donkey Kong games or missed a few. Hope this'll serve as a good reference for those of you playing the game, the enemies should be easily to recognize even without pictures. In the game you have two playable characters, which you may cycle through at any time by pressing the SELECT button, assuming you've picked up a DK Barrel already (they are pretty common, and included on all except boss levels). Diddy Kong - Smaller, faster. Donkey Kong - Bigger, stronger. Army - This little armadillo-like foe will wait patiently until you get close, then roll up into a ball, and then roll after you. As Donkey Kong a roll or jump will kill it, as Diddy Kong it'll take two, the first will only stop it's movement. Chomps Jr. - Baby sharks, swim only right and left and can easily be avoided. Chomps - A large sharklike creature that can be generally very annoying, it's quick and swims in a squiggly manner. Clambo - A clam-like creature that opens and closes. Be careful not to get snapped! Drum - Drums that spit out foes, not really enemies, but not friendly either. Can be destroyed with a nice TNT blast. Fangfish - A bloated fish that moves in a squiggly fashion right and left. Hogwash - A flying pig, that, ehh, flies. You can often use it to reach secrets or certain items, or to pass over large gaps. Gnawty - A small beaver-like foe that toddles across the screen pretty quickly. Klaptrap - A tiny crocodile-like foe that crawls across the ground and bites. Can't be rolled on, you better stay clear of it's large jaws! Klump - A strong foe that walks around on two legs, pretty much like the kritter. Kritter - The most frequently appearing foe in the game, a dinosaur-like critter walking or jumping around. Krusha - These foes are so strong that Diddy just bounces off them when trying to stomp them down, it's the only foe only Donkey can defeat by jump. Mincer - A spikewheel that spins around, and around. I mean, it spins around as it spins around. Mini Necky - A small bird that likes to throw coconuts. Necky - The fullgrown Necky, shoots coconuts straight at you. Nemo - An octopuss-like foe that chases you. It's quick and cannot be killed, so watch out! Oil Drum - It burns, occasionally. Watch out for the fire! Slippa - Snake! They slither on the ground, and sometimes down ropes or other obstacles, where they pose a much larger annoyance. Slippa Jar - A strange jar that spits out enemies, of the Slippa type. Can only be killed by a good TNT blast. Snapper - Small crab-like creatures that push upwards and then drift downards across the screen. They can't be killed, so watch out! Swirlwind - A little worldwind you can ride and jump on, just be sure not to get hit by its sides! Zinger - Buzz! Watch out for these beelike creatures, they sting. For each boss you kill you'll be rewarded three banana crowns, except the final one, there you'll get credits instead. Wild Sting - A stingray-like foe that swoops down towards you. Jump on it four times to bring it down. Colossal Clambo - A clam that occasionally moves, opens up, and spits a clam at you. Position yourself infront of the closed clam and move quickly when it has shot a pearl. The pearl will bounce back at it ... unless you get in the way. Hard Hat - This mole will pop out of a hole and throw its hat at you, so jump on its head when it does. Note that if it pops up under you, you won't be harmed, just pushed aside. King K. Rool - The king. He'll take off his crown and throw it at you, so jump on his head when he does. He'll then run across the level (which is twice as large as the normal boss level) and repeat the procedure 6 times. After that, he'll start pouncing at you and running across the screen. Position yourself right infront of him when he does and chase him once he's jumped over you for the best results. After 4 jumps he'll start throwing his hat again for a while, so go back to jumping on his head. You'll need patience while fighting this boss! On occasion two animals will appear packed in crates, ready to assist you in your journey across the levels. They can kill all normal enemies (no oil barrels, and similar), even zingers! Note that they will disappear once you enter a bonus level, die, or exit the level. Expresso, Ostrich - Press the jump button twice to double jump, and keep pressing it to stay in the air, sliding downwards slowly. Rambi, Rhinoceros - Rambi easily bashes all foes in your way, and runs faster than you do. Barrel - Regular barrels don't explode when they hit an enemy, they'll just keep rolling rolling until they reach a gap. They can also be used to blast open secret doors in walls. Crate - Crates contain friendly animals, jump on it to find out which one. DK Barrel - Just look for the barrel with DK written on it, you can't miss it. Pass through it and you'll be able to play as both Diddy and Donkey Kong, which you can switch through with the SELECT button. Get hit by an enemy and the remaining character (the one you aren't playing as) will switch in. If you already have both characters you can throw a DK barrel at enemies. TNT - The title sais it all. Throw it at regular enemies or obstacles such as Oil Drums, all harmful things will go up in flames. Kong Letters - There are four of these on each (normal) level. Collect all four ( K O N G ) to save the game, and to get that neat melody at the end of the level. Kong Tokens - These round tokens are collectible throughout the game. On certain bonus levels you can exchange them for extra lifes. Balloons - Balloons give you an extra life, most of them float upwards when you see them so you'll need to be quick to catch one. Bananas - Monkeys love bananas! Collect a hundred and get an extra life! Banana Crowns - Counts as ten bananas. Yummy! Clouds - They'll disintegrate quickly when you've stepped on them, so be quick! Lifts - Jump on them and get somewhere. They come in all kinds of shapes and sizes. Some change direction when you jump on them. Rocks - They fall down, watch out. Ropes - Climb on them, swing from them, or just cling on as they take you somewhere. Tires - Roll them, and jump on them to get an extra boost. There are both stationary and movable variates. Warps - At the end of the level you'll find a portal with a swirl in it, enter to exit the level. - Hold down B constantly for added movability. - Don't make a habbit of rolling through your enemies, some can't be rolled through, jumping is usually less painful. - Keep an eye on the edges of the screen if you want to find secrets. You'll see at least a part of all bonus game barrels, clouds, etc. - Rolling off the edge, then jumping, lets you get through tough places. - Usually the goodies are high up (on land levels), so get the high ground if you can. - Don't move too much on platforms, you won't slide at all while landing, so adjust your jump in the air and stop pressing buttons when you've landed. - If you need extra lifes fast, run through the level on the pirate ship in world one, or level five in world three, and the secrets are the most important parts! You'll get four balloons & at least a couple of lifes by bananas (more with tokens) in each level. I won't spoil this for you, and it's no fun making a walkthrough when I can't take screen shots as I go anyway. The game is easy, you won't need this, really, play a bit instead.